Hyundai will launch the new generation Santa Fe at the Geneva Motor Show in March. Few details have yet been announced, but we're expecting a £33,000 price tag. Hyundai's flagship model is being shaken up for the first time since 2012 and it looks, well, very brown. The new Santa Fe will be revealed at a special world premiere event later this month, before making its full public debut at the Geneva Motor Show 2018. 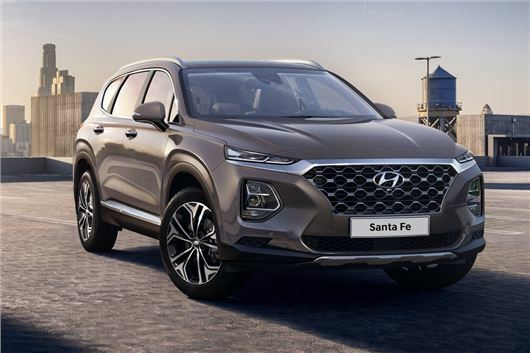 Displaying slim headlights, a large grille and big wheelarches, the first official pictures of the fourth generation Santa Fe show a noticeable upgrade from the previous model. In fact, it looks like a beefier version of Hyundai's new, smaller SUV - the Kona. With a length of 4770 mm and a width of 1890 mm, the new incarnation is longer and wider than the outgoing model, with Hyundai saying the seven-seater will have more refinement and comfort. The Santa Fe's interior has been modernised and simplified. There's a floating tablet infotainment system, as well as some horizontal vents, a new steering wheel and an instrument cluster with a digital display. In terms of safety features, Rear Cross-Traffic Collision-Avoidance Assist is a Hyundai first. When reversing out of areas with low visibility, the system not only warns the driver if vehicles approach from the side – it also applies the brakes automatically. The newly-introduced Safety Exit Assist, which builds on Hyundai's current SmartSense assistance tech, temporarily locks the doors when it senses a vehicle approaching from behind. This removes the likelihood of a passenger opening the door into the path of an oncoming car. The current Santa Fe only offers a 2.2-litre four-cylinder diesel in the UK, offering 194PS and all-wheel-drive. So far, nothing has been confirmed for the new model, but further details will be revealed at the world premiere later this month.